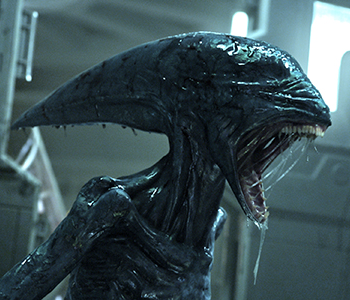 Director Ridley Scott has admitted there will be no Xenomorphs in the Prometheus sequel. Prometheus has quite the reputation with Alien fans, namely in the disappointment with how the movie turned out (compared to what it should have been). Some cite the issues began when the original script started as a direct Alien prequel, instead of the spin-off it eventually became. Director Ridley Scott won't allow the same mistakes to be made with Prometheus 2. In a recent interview Scott discussed how development is underway for the film, even though he's currently focused on other projects. "Right now, as we speak, it's being written. I've had 15 drafts evolving." The ending scene of Prometheus (spoiler warning) had what looked like a subspecies of a Xenomorph gruesomely tearing apart its Engineer host. The creature, known as the Deacon, turned out not to be a Xenomorph, but its presence still gave fans hope that Xenomorphs would play a prominent role in future sequels. Scott has now confirmed that will not be the case. "The beast is done. Cooked..." "I got lucky meeting Giger all those years ago. It's very hard to repeat that. I just happen to be the one who forced it through because they said it's obscene. They didn't want to do it and I said, 'I want to do it, it's fantastic'. But after four, I think it wears out a little bit. There's only so much snarling you can do. I think you've got to come back with something more interesting. And I think we've found the next step. I thought the Engineers were quite a good start." There is currently no release date set for Prometheus 2, but it's speculated it will be sometime in 2016.